Short tutorials by librarians showing how to use various research databases. Ask A Librarian: How Do I Get Access To Library Resources? This video shows how to use library resources and what to do to make sure you're recognized as a Cornell user. Useful for all classes, it demonstrates the bookmarklet Passkey. Ask A Librarian: How Do I Find High Impact Articles? There's so much information out there, how do I know which articles are the most important? Designed for BME 4110 with Professor Nishimura, this video demonstrate searching Web of Science and Journal Citation Reports. Ask A Librarian: How Do I Find Primary Research Literature? Designed for MSE 3030 with Professor Thompson, this video will show you how to find primary research literature, especially what are referred to as 'peer-reviewed' papers. In particular, it focuses on the Engineering Village database and on Google Scholar. Ask A Librarian: How Do I Find Authoritative, Scholarly Articles? How to find scholarly, important articles when the web is bursting with information? Designed for BME 4110 with Professor Nishimura, this video advocates searching PubMed over Wikipedia and Google Scholar. Ask A Librarian: How Do I Find Phase Diagrams? Designed for MSE 3030 with Professor Thompson, this video shows where to find authoritative phase diagrams from two databases - ACSERS/NIST Phase Equilibria Diagrams and ASM Alloy Phase Diagrams. Ask A Librarian: How Do I Use the CRC Handbook of Chemistry and Physics? Designed for MSE 3030 with Professor Thompson, this video demonstrates how to find and use the online CRC Handbook of Chemistry and Physics. 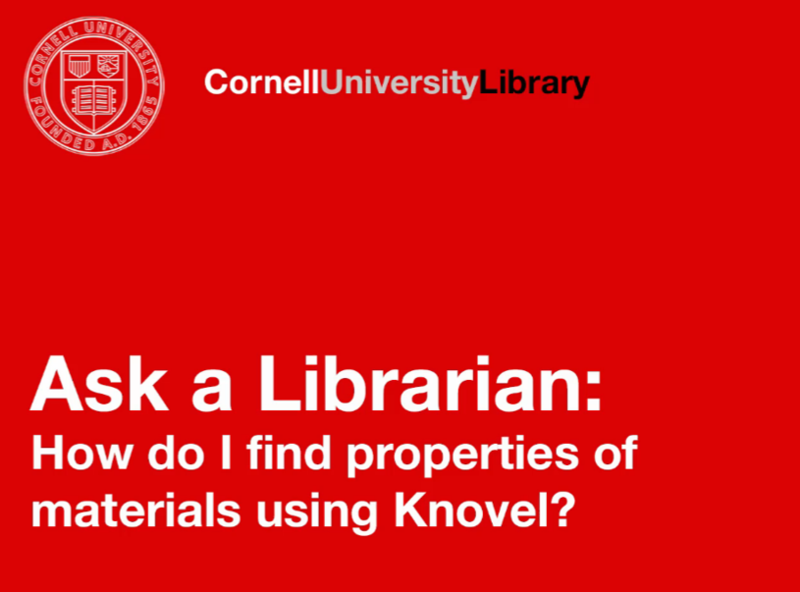 Ask A Librarian: How Do I Find Properties of Materials Using Knovel? Designed for MSE 3030 with Professor Thompson this video talks about how to use the Knovel e-books collection. Knovel is a collection of engineering handbooks and textbooks. It can be searched for keywords or, with the Data Search, you can find the properties of a specific material. Look beyond YouTube for high quality scholarly videos. Designed for BME 4110 with Professor Nishimura and MSE 3030 with Professor Thompson, this video demonstrates JOVE, Journal of Visualized Experiments. Many people were involved in the video creation besides Jeremy Cusker and Jill Powell. Also involved were Sean Taylor, Kathryn Dimiduk, Zsuzsa Koltay, Carla DeMello, Melanie Lefkowitz, Nozomi Nishimura, Mike Thompson, Robert Bell, Gaby Castro Gessner, Meredith Silberstein, and Matt Ryan.